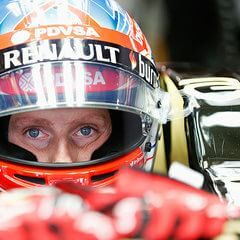 Frowning in France, excitement at Enstone // What does Lotus' power unit switch mean for Grosjean? Before Daniel Ricciardo made his smile famous throughout the paddock, there was another driver who could be relied upon for a happy grin – Romain Grosjean. After overcoming a difficult start to his F1 career, the Frenchman was riding high in 2013. He earned himself six trophies, and finished the season seventh overall, only disappointed to miss out on victory in a car that could have been capable of such a feat. Freed from the shadow of teammate Kimi Räikkönen who made the switch to Ferrari, Grosjean was anticipating even better things from 2014. And that is where he couldn’t have been more wrong. From the moment the car hit the track in testing (which it didn’t very often or for any protracted period of time), it was clear Lotus had themselves a real handful. The season has dragged on for both Grosjean and teammate Pastor Maldonado, but the frustrations have finally told for Romain, as seen in recent weeks. For him, as for most of the team, there is one specific culprit. “I cannot believe it! Bloody engine, bloody engine!” Romain was heard to shout after qualifying for the Singapore Grand Prix saw him down and out in 16th. Compared to his third place the previous year, the lowly grid spot wasn’t appreciated. Lotus aren’t the only ones to have struggled with the Renault power units this year. Defending champions Red Bull not only lack the pace of the more dominant Mercedes, they have had their fair share of reliability issues. Sebastian Vettel is just biding his time before taking a penalty for using all his allowed power units and more this year. Lotus, however, have taken matters into their own hands. They confirmed this week that from 2015, they’ll be switching to Mercedes AMG High Performance Powertrains, embarking on a long term deal with the German manufacturer. It must be a wrench for the squad, a team that were formerly the Renault works outfit before becoming Lotus in 2011/12. Yet, it points towards a brighter future, as the CEO of Lotus, Matthew Carter, is keen to point out. "We intend to return to the front of the field with the goals of winning Grands Prix and being a strong championship contender once more and we see this new agreement as one step towards this aim... It is our desire that the E23 Hybrid, powered by Mercedes-Benz, heralds a new era of success for Enstone." With success on the cards at Lotus, or at least on the list of objectives for the next few years, the future should be looking brighter for Grosjean. He has recently said he’s in no hurry to sort out his future, and that Lotus don’t have to convince him of what they’re capable of. He specifically mentioned them getting their hands on "a good engine", something that is likely to steer his decision. Of course, there is one small problem. Will Grosjean remain with the Enstone team for next year after all? The deal with Mercedes includes a partnership with oil specialists Petronas, replacing their current deal with Total. That’s Total, the French oil company who also have a hand in sponsoring a certain Frenchman driving for the up-to-now quite French team. So whilst celebrations must be had for the news that the horrific red livery accents will no longer be around, it must be tempered by the thought that Grosjean may not be either. Having a personal sponsor can dictate where you end up on the grid, but it doesn't have to be the end of the story. Lotus appear to have had a boost in their budget, with a handful of job postings appearing on their website, a new deal for engines from the almost certain 2014 champions, and whatever Pastor Maldonado is paying to remain in that seat. If they have all of that, perhaps they don’t need what Total was giving them and they can keep Grosjean around? If not at Lotus, I'm not sure where else he could comfortably fit. He has a friend in Éric Boullier, and McLaren may be looking to shake things up for 2014. But the Honda engine is a complete unknown at this point, and after a season that has driven him to distraction, he may be looking for the comfort of a bit of certainty. Plus the seats towards the top all have bigger names attached to them, and the midfield probably isn't what he's aiming for. Whilst being in a Force India would be a huge step up for Grosjean from this year's paltry finishes, his potential from 2013 is probably pushing him to want bigger and better. His work to turn around a crash-happy debut into a seasoned professional career showed commitment to the cause, and this year hasn’t delivered anything like what he deserves from a car. There’s earning your dues, and then there’s driving a 2014 Lotus. 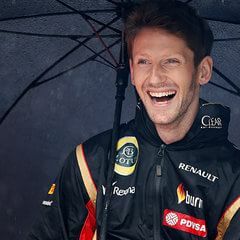 Whatever happens for the 2015 season, whether Grosjean stays or goes, and whether Lotus win or lose, all I hope is that we see a return of the happier Romain, the smiling Frenchman we saw in 2013. Even if Ricciardo does smile enough for everyone. Does driving in Formula 1 mean giving up your private life?